• All Aboard for the Hartford Line! • Northampton | Expanded Station Platform to Move Ahead? All Hartford Line passenger rail service (CTrail and Amtrak) will be FREE this weekend. The largest rails-to-trails conference of the year in New England. All Aboard for the Hartford Line! Ride for free from Union Station to Union Station this weekend! Free service on the Hartford Line (CTrail and Amtrak trains) all weekend long. And — there will be FREE parking at the Union Station Parking Garage (1755 Main St, Springfield) this weekend. Making plans to ride the Hartford Line from Springfield? For those of you using the new Hartford Line, please keep in mind that this service is unique in many ways. In particular, the service is being provide by two distinct operators — CTrail and Amtrak — which as far as we know, is a first in this country. All of the details have yet to be totally worked out, in particular a few issues related Hartford Line ticketing (CTrail vs. Amtrak). 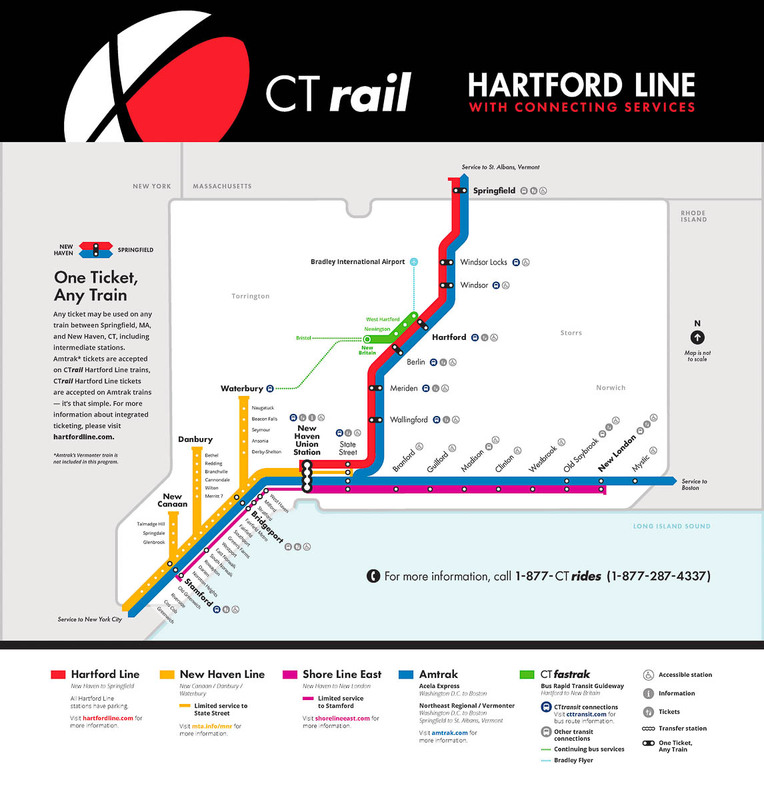 Our Advice to You — if you are traveling between Springfield and New Haven on the Hartford Line — if possible, purchase your ticket from a CTrail ticket vending machine — not the Amtrak website. Why? Because there are still a few open questions related to the use of Amtrak tickets on Hartford Line trains. In a nutshell — Amtrak-issued tickets are for a “reserved coach seat” on a specific Amtrak train on the Hartford Line, which implies that the ticket is valid only for a specific train. The Hartford Line website does say that “valid” Amtrak tickets can be used on any CTrail train but we have yet to find out what the term “valid” means in this context. If you have comments about the new service please let CTDOT know. The final version of the 2018 Massachusetts State Rail Plan was released today. The final plan includes a new chapter, Chapter 6, which details MassDOT’s public engagement effort and summarizes the updates to the plan from the draft version. We note in particular MassDOT’s comment (in Chapter 6) that they received nearly 300 emails and letters during the public comment period, including an open letter signed by 667 high school students in Western Massachusetts on their support of a feasibility study for East-West rail. We will have further comment on the Final version of the State Rail Plan in a future edition of the Rail News Update. An insightful look at what the coming Hartford Line might mean for the Springfield–Hartford–New Haven corridor. At long last, the City of Springfield offers a Commuter Rate for parking at the Union Station Garage. Effective Mon. June 18, 2018 the commuter rate for parking in the garage will be $5. Effective for July 2018 the monthy parking rate will be $65. This is really significant news because until now the parking rate had been $20/day — which is a level which was simply not attractive to people in this area. Thanks go out to Springfield Mayor Domenic Sarno the executive leadership of the Springfield Redevelopment Authority for making this happen. Northampton | Expanded Station Platform to Move Ahead? 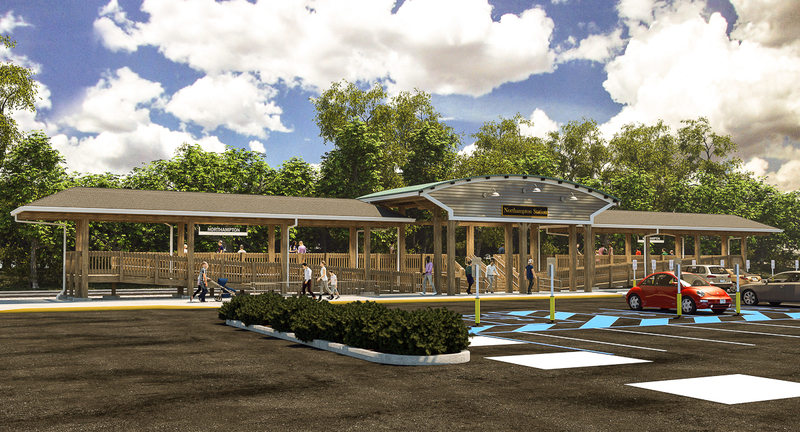 Late today we received word that the delayed project to expand the station platform in Northampton may finally be ready to move forward. We don’t have the details yet, but as soon as we do we’ll be sure to let you know. One June 8th MassDOT Secretary Stephanie Pollack joined Northampton Mayor David Narkewicz, MassDOT staff, local leaders, and members of the public to celebrate the ceremonial ribbon-cutting for the new bicycle/pedestrian underpass beneath the MassDOT owned Connecticut River Line in Northampton. 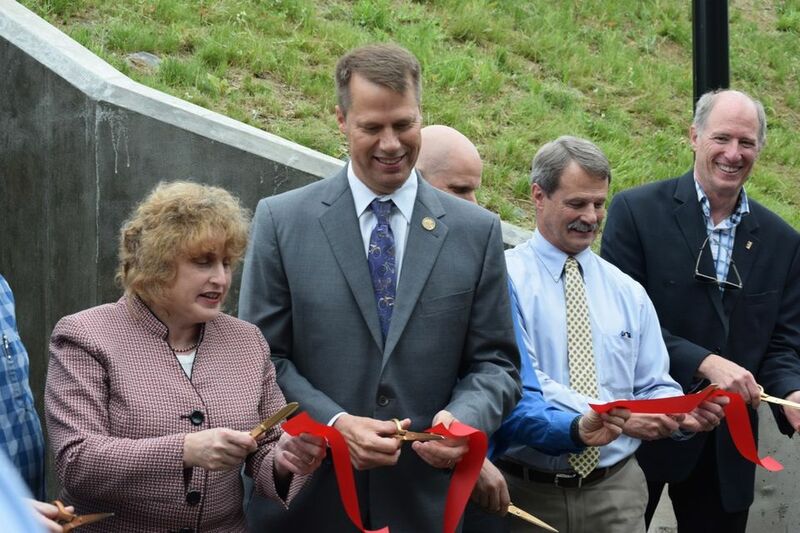 This new $4.4 million underpass in the area of Woodmont Road and King Street connects the Mass Central Rail Trail – on the east side of the railroad tracks – with the Northampton Bike Trail on the west side of the railroad tracks. It was a 43 years ago (i.e., in 1975) that the idea of a bicycle tunnel under the Connecticut River Rail Line was first floated, said Mayor David Narkewicz. Specifications were first developed 25 years ago, and construction finally starting in 2016. 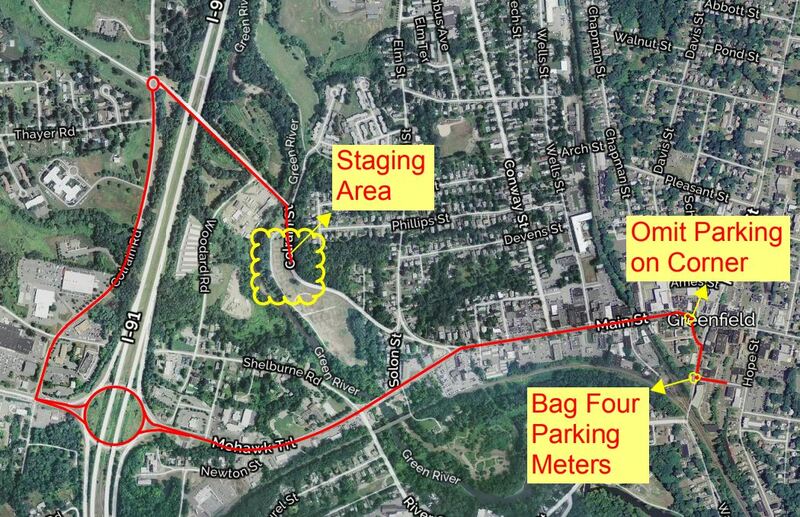 Pre-cast Traffic Route | Olive St Parking Garage | Greenfield, Ma. The parking garage across from the Olver Transit Center is coming together. Concrete pours for the footings and foundations have been completed. The crane (300-ton lift capacity) arrived on Mon. June 11th and the contractor began installing precast concrete panels on the site on Wed, June 13th. The garage should be completed before the end of 2018. 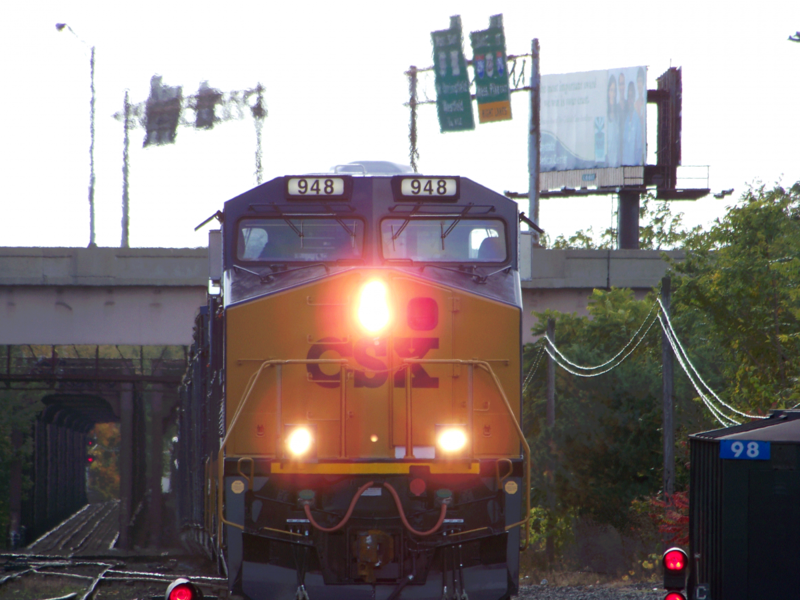 CSX GE-ES44AC Locomotive #0948 on the headend of a Freight | Springfield, Ma. Tim Brennan, the Executive Director of the Pioneer Valley Planning Commission, makes a strong case for moving more freight over an improved and modernized rail network in Western Mass. Western Massachusetts Politics & Insight this week took a fresh look at Senator Lesser’s four-year effort to get the state to study East-West rail. Their work is a masterful piece of political analysis. As always, a must-read for people in the Valley who are following the ins and outs of this long running story of political intrigue.